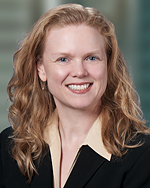 Jennifer Wood Dienhart’s practice focuses on eminent domain, inverse condemnation and other complex business disputes. Ms. Dienhart has represented clients in disputes concerning condemnation of real property, inverse condemnation, breach of lease agreements, breach of purchase and sale agreements, and adjustment of rental rates, among others. Her eminent domain experience includes cases concerning total and partial takings, loss of business goodwill, precondemnation damages, and severance damages. She has advised clients regarding pre-condemnation activity and relocation benefits. Ms. Dienhart recently spoke at the International Right of Way Chapter 57 regarding eminent domain at the Supreme Court. She has also co-authored articles regarding the United States Supreme Court eminent domain decision in Kelo v. City of New London and appropriate dates of value. Ms. Dienhart was named in Orange County Metro magazine’s 2014 “Top Attorneys” List in the category of real estate law. Riverside County Transportation Commission v. Giant Inland Empire RV Center Inc., et al. – Represented owners of an RV dealership located at 2100-2200 Frontage Road and 1307 Pomona Road in Corona along the 91 Freeway. RCTC sought to acquire the property for the I-91 widening project. Giant RV sought approximately $4.2 million for its lost business goodwill and real estate interests. The case settled before trial for $3.9 million. Riverside County Transportation Commission v. Pearl Street Properties, LLC, et al. – Represented the owner of Newport Farms, a successful family-owned and operated food service distributor in the City of Corona, adjacent to the 91 Freeway. The partial taking impacted semi-truck access, circulation and parking. RCTC’s initial offer was $1,360,000. The case subsequently settled for $3,500,000. B & H Education dba Marinello Schools of Beauty v. Los Angeles County Metropolitan Transportation Authority – Marinello was a cosmetology school operating as a tenant in a building on Wilshire Boulevard in the City of Los Angeles. Marinello was displaced by LACMTA and forced to relocate as a result of LACMTA’s Westside Subway Extension Project. LACMTA failed to initiate a direct condemnation action, forcing Marinello to file an inverse condemnation proceeding. In a bench trial, LCMTA was found liable for inverse condemnation and Marinello proved it was entitled to claim compensation for loss of business goodwill. The case subsequently settled for $2,500,000. People of the State of California by and through the Department of Transportation v. Plaza West Covina et al.– Represented the landowner in an eminent domain action brought by Caltrans. Plaza West Covina owns a freeway-prominent 11,258 square-foot retail pad in the City of West Covina. Caltrans sought a full-take of the property for its Interstate 10 high-occupancy vehicle lane project. Caltrans’ initial offer was $3,136,000. The case settled before trial for $7.8 million, plus costs in the amount of $10,925. Orange County Transportation Authority v. Lakeview Orchard Association – Represented the Lakeview Orchard Association, and its members, in an eminent domain action brought by OCTA for its Lakeview Avenue Grade Separation Project in the City of Placentia. OCTA initially offered $743,000 for the taking of two easements and severance damages. The case settled before trial for $1,975,000 in compensation for the takings, and damages, plus costs of $10,843 and interest of $4,256. People of the State of California by and through the Department of Transportation v. Capricorn Realty, Inc., et al. – Represented owners of a quick service restaurant property in the City of Norwalk. Caltrans sought to acquire the property for the I-5 widening. Caltrans’ initial offer was $460,000. The case settled before trial for $1,832,000. City of Santa Fe Springs v. PPF Industrial – Assisted with representation of Morgan Stanley/PPF Industrial, the owner of a 17-acre industrial park, a portion of which was condemned for a grade separation project. The condemning agency initially deposited $516,000. The case settled for $2,750,000. City of Riverside v. PSIP Magellan I, LLC – Represented industrial real estate owner in the City of Riverside. The City sought to acquire portions of its property for a grade separation project. The City’s initial offer was $568,200. The case settled before trial for $1,250,000. Southern California Industrial Federation adv. Caltrans – Represented industrial real estate owner in Santa Fe Springs. Caltrans sought condemnation for Interstate 5. Assisted with preparing a $9 million sales agreement preserving the client’s ability to seek additional precondemnation damages and reimbursement of environmental remediation offsets. People of the State of California, by and through the Department of Transportation v. Altmans, et al. – Represented the owner of an RV dealership against Caltrans. Caltrans initially offered $958,000. The case settled one week before the jury trial was to begin for total compensation of $7.85 million. People of the State of California by and through the Department of Transportation v. Steiny – Represented Steiny & Co. (and its owners) in an action brought by Caltrans to acquire portions of Steiny’s property in Baldwin Park for the I-10 widening. Caltrans’ initial offer was $151,000. The case settled prior to trial for $600,000. Universal Field Services, Inc. v. City of Lynwood – Represented Universal Field Services, Inc. in a dispute alleging breach of warranty and fraud against the City of Lynwood concerning payment for work completed for the City’s Ham Park Replacement Project. People of the State of California by and through the Department of Transportation v. Bayport Imperial Promenade, et al. – Represented business owners facing condemnation of a portion of their leased land and loss of business goodwill. City of Palmdale v. McDonald’s Corporation, et al. – Represented McDonald’s Corporation in a condemnation action where the City acquired a portion of their leased land. Stueve Bros. Farms, LLC et al. v. Orange County Flood Control District et al, – Represented the District in an inverse condemnation lawsuit seeking damages of over $60 million. Lawsuit was dismissed at the pleading stage after the court sustained the District’s demurrer without leave to amend. Riverside County Flood Control and Water Conservation District adv. Goeppinger – Successfully defended the District in an inverse condemnation and nuisance case at a legal issues trial resulting in a defense judgment on three of four claims. Los Angeles Unified School District – Assisted LAUSD with the condemnation necessary for school construction projects. Riverside County Flood Control and Water Conservation District – Assisting the District with the condemnation of property required for new flood control projects. County of Riverside – Assisted the County in acquiring property required for new roadway projects. Orange County Bar Association, Mentoring Committee Co-Chair 2010-2011. Orange County Federalist Society Lawyers’ Chapter, Executive Board member 2003-present. International Right of Way Association, Chapter 67, Former Board Member. Speaker, “When We Need It Now: Multi-Parcel Acquisition Programs,” CLE Eminent Domain Conference, Los Angeles, CA (May 15, 2014). Speaker, “Eminent Domain at the Supreme Court After Kelo,” IRWA Chapter 57, Riverside, CA (January 8, 2014). Speaker, “The Mechanics of Obtaining Prejudgment Possession,” IRWA Chapter 57 Seminar, Riverside, CA (November 2, 2012). Speaker, “From Resolution of Necessity to Order of Possession,” CLE 10th Annual Conference, Los Angeles, CA (May 10, 2008). Co-Author, “Low-Profile Anderson Initiative Would Change Eminent Domain and Land-Use Planning Radically,” California Real Estate Journal, July 31, 2006. Co-Author, “Anderson Initiative Goes to Extraordinary Lengths to Limit Eminent Domain,” Daily Journal, July 25, 2006. Co-Author, “Does Anybody Really Know What Time It Is? Deposits and Dates of Value in a Post-Kelo World,” Article included with the Los Angeles County Bar Association Eminent Domain Section Lunch materials, May 16, 2006. Co-Author, “Kelo v. City of New London: Action . . . Reaction . . . Overreaction?” Article included with the County Counsels’ Association of California Civil Law and Litigation’s Annual Conference materials, April 26, 2006.